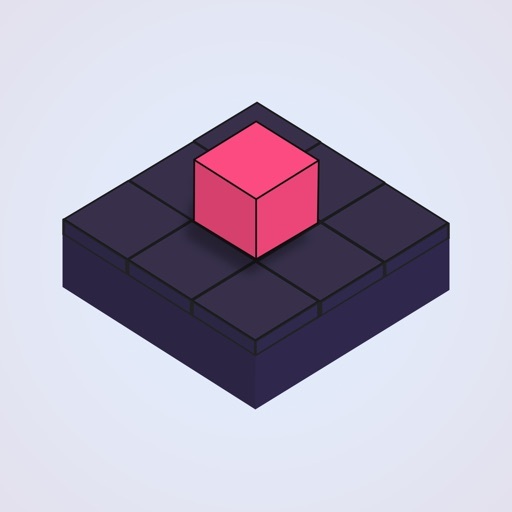 Cuzzle (Free) by GalacticThumb is a Sokoban-style puzzle game that will keep your mind stimulated for a while. If you enjoy calming games like Cosmic Express and KAMI 2, then you’ll like having Cuzzle in your collection. 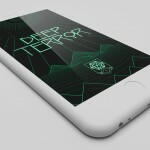 It’s from the same developer behind the recently released Float. I’ll admit it — I’m addicted to my Nintendo Switch these days, but even that needs to get a break every now and then. For those breaks, I like to kick back and relax with something fun yet soothing on my iPhone, and what suits that better than puzzle games? 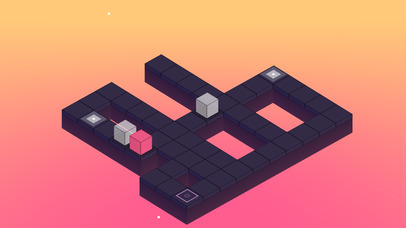 I’m a sucker for puzzle games (even if they stump me at times), and while I feel like I’ve played almost all of the good ones on iOS already, I’m always on the lookout for new titles. So when I got wind of Cuzzle, I was intrigued, even though it’s not an entirely new concept in terms of puzzle games. Still, I had to check it out because it’s new and shiny, and it doesn’t disappoint. Visually speaking, Cuzzle is fairly minimalistic but it’s still aesthetically pleasing to the eyes, especially if you’re into simple design. 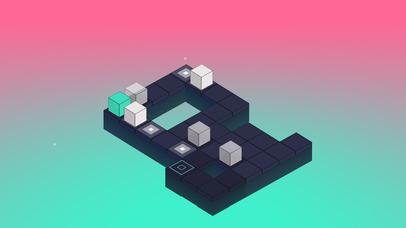 The game is rendered in 3-D with isometric graphics and an angled, top-down perspective so that you can see the entire grid layout in a single glance. The color palette features blacks, whites, and grays on top of radiant gradient backdrops, with a single colored cube adding a splash of color to the otherwise monotone grid. The animations in the game are smooth and fluid, so I had no issues on my iPhone 7. 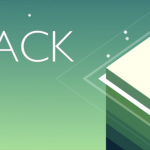 There is also a super ambient and atmospheric soundtrack in the game that will help you relax and focus on the puzzles, and the sound effects are delightful to listen to as well. Like his other releases, I think Cuzzle has some great visual and audio design that would appeal to many. 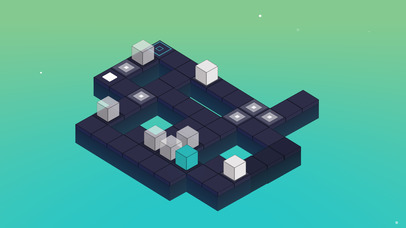 Like many other puzzle games, Cuzzle is level-based, and there are four unique chapters that have about 30 levels each. In the App Store description, the game states that there are 90 levels at the moment, so the actual number of stages in each chapter varies. While you can see the total number of puzzles to solve in each chapter, you can’t just pick-and-choose the stage you want to play, as you’ll still need to go through them in chronological order. 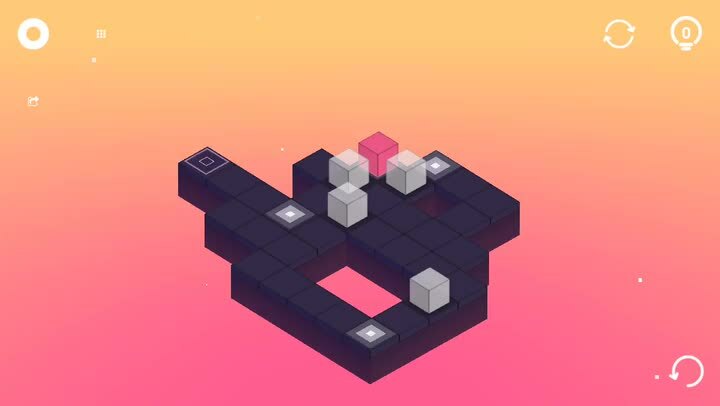 The goal of the game is simple and straightforward: get all of the white blocks in their proper position to unlock the portal for the colored cube. 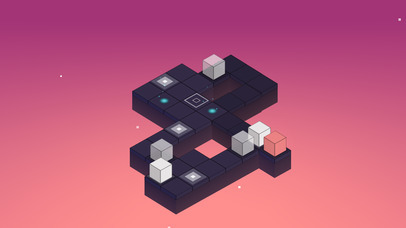 It sounds easy enough, but the puzzles get trickier as you go. And to keep things fresh and interesting, a new game mechanic is introduced in each chapter, which helps keep you on your toes. 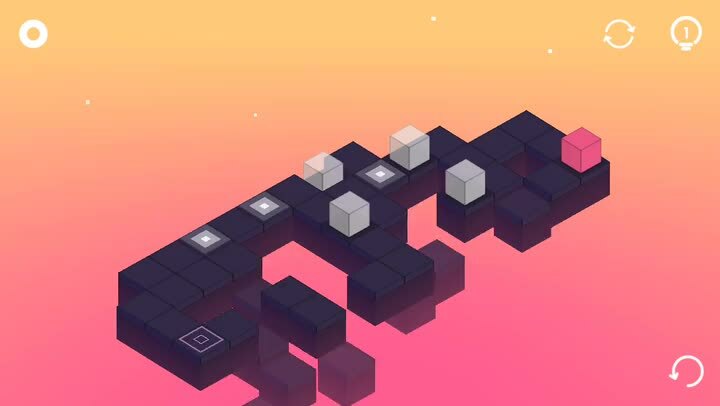 The best thing about Cuzzle, though, is the fact that the game has no move restrictions, time limits, or even stars to worry about — there are no penalties, so you can solve each puzzle at your own leisurely pace. Controls in Cuzzle are intuitive and responsive. Since you can only move the colored block, just swipe in the direction you want it to go and it slides one square at a time. 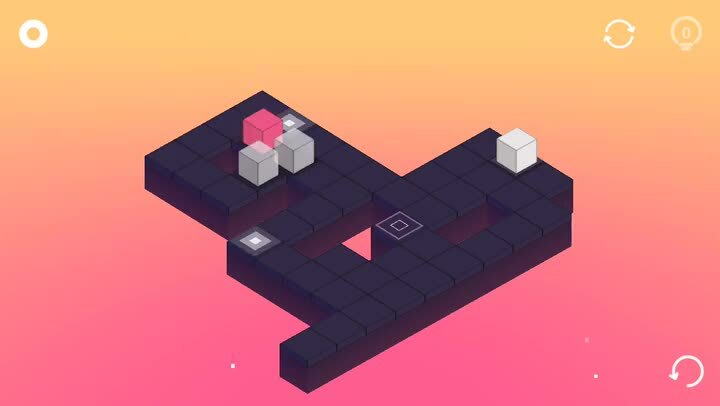 To get the white blocks in their places, you’ll need to use the colored cube and push it into the white ones to move them one space. When the blocks are in their spots, you get audio feedback, which is nice. However, keep in mind that you can’t pull a white block back, so you have to try to avoid pushing a white or colored block into a spot that you can’t get it out of. If you make a mistake, you can use the undo button in the bottom right corner to go back one move at a time. A restart button at the top of the screen lets you start the stage over from the beginning. If you are truly stuck, you can use the solution button in the top right corner to watch the AI solve the puzzle for you. Unlike other puzzle games I’ve played, the solution system in this game just outright shows you how the level is done and does it for you, rather than just give you a hint or clue on what you should do. I’m not that much of a fan of this system, because I don’t want to be shown the entire solution and have it done for me — I’d prefer just having a clue and then left to figure the rest out on my own. Plus, you only get one solution to start with, and then after that you can get free solutions by watching video ads or you can get unlimited solutions through a $2.99 in-app purchase, which also gets rid of all ads. And on the topic of ads, I did not encounter too many of them aside from getting a free solution, so the ad system is not intrusive at all, unlike some other recent games I’ve played. I’ve only just started Cuzzle recently, so I’m still in the early stages (and I don’t want to rely too heavily on the solution system) but I’m enjoying the game so far. I’m a fan of minimalism, so the visuals are definitely something I like, and the music is also incredibly well done. The controls work out well for this type of game, and the puzzles themselves prove to be rather challenging. I would prefer that the game have hints rather than full-on solutions, but it’s not a big deal-breaker. I recommend any puzzle fan, especially of Sokoban-style puzzles, to give Cuzzle a try. You can find Cuzzle on the App Store as a universal download for your iPhone and iPad for free with an in-app purchase to get rid of ads and unlock unlimited solutions.